Unlike Christmas, New Year’s Eve is infrequently the subject of animated specials. It might be from a lack of holiday icons other than the Baby New Year and the Old Year/Father Time, or that it’s a holiday often more heavily geared toward adults (parties, etc.). There’s also little about it to commercialize compared to the big holiday a week earlier. Still, I thought I’d take a look at the few animated specials dedicated to the turn of the calendar. A 1986 “Peanuts” special. The gang is preparing for a New Year’s Eve party. However, Charlie Brown struggles with being saddled with (apparently by a sadistic teacher) the age-inappropriate book “War and Peace” for a winter break book report. Not one of my favorite “Peanuts” specials. I guess I never bought ol’ Chuck getting stuck with “War and Peace,” even by his out-of-luck standards. Granted, the “Peanuts” specials also had waned in popularity and quality by this point from their 70s high point. The 2015 movie “The Peanuts Movie” handled the idea of Charlie Brown reading “War and Peace” much better. In the film, he’s actively choosing to read the book on his own, with ill-fated results. This special aired for awhile in the 80s. It then vanished until recently, when ABC began airing it again. It’s usually paired with another special. 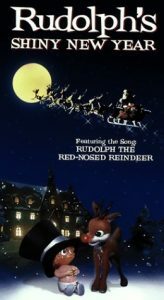 This Rankin-Bass special, first aired in 1976, features Rudolph trying to save Happy, the “Baby New Year.” He’s not only run away from home, but is also being hunted down by Aeon the buzzard. Aeon wants to prevent the new year from arriving for his own ends. Rudolph is thus sent by Father Time to the Archipelago of Last Years to search for Happy. When the old year’s reign ends on December 31, the year retires to the Archipelago and selects an island for himself; time on that island is frozen as the year in which he reigned. Thus, the island of “1776” looks like colonial America, and its “former year” resembling Benjamin Franklin. And yes, this special was made just in time for America’s big 1976 bicentennial celebration. “Shiny New Year” usually airs on ABC between Christmas and New Year’s. It also airs throughout December on ABC Family. 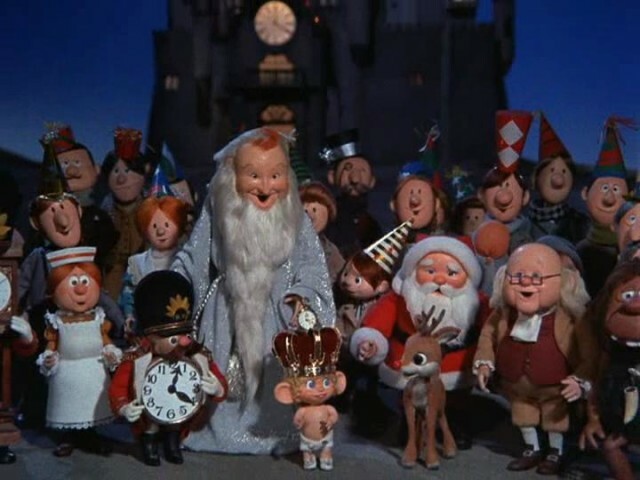 It’s included as an extra on “The Year Without a Santa Claus” DVD, as well as the various Rankin-Bass holiday special box sets. 6Teen’s “Deck the Mall” Christmas episode sees the gang react negatively (but hilariously) when they remember (too late) what they day after Christmas is… especially given what the characters spent the episode going through just dealing with Christmas. An episode of one of the “Total Drama Island” spin-offs has the vapid airhead Lindsay mention Boxing Day sales, which of course would be right up her alley. For Americans reading this, Boxing Day is a holiday that falls the day after Christmas, and usually a day off. Like Black Friday in the US, it’s the biggest shopping day of the year in Canada, the United Kingdom, etc.